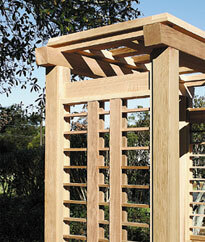 Contemporary lines and an Asian sensibility are fused to create a fresh new look in garden arbor design. The strong geometric pattern in the louver-like side panels creates an interesting alternative to the traditional lattice structure. Available with our lattice extensions or with any of our gate styles as referenced in our Arbor Gates and Extensions section. 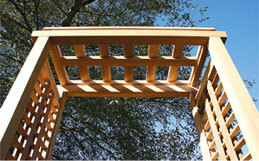 The opening for this arbor may be customized to greater widths. Constructed of clear, kiln dried western red cedar, Cambara mahogany and stainless steel fastenings. 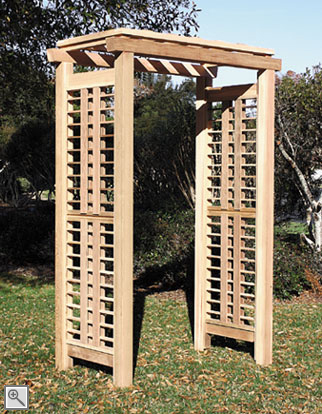 The opening on this arbor may be altered to any size up to 6'.